April 25, 2016 by fmgarchitects. The shortcomings of coherent transport planning for Dublin has been well-publicised over the years. It is interesting however to look back at what we have been saved from. The image above was published in the Architectural Review in 1974 in a special edition on Dublin. The before-and-after image was prepared by the magazine to illustrate the impact of the then-proposed “Central Dublin Traffic Plan” would have on the city centre. The image illustrates the impact part of the “recommended route for the Western Section” of the Tangent Ring Road would have had on the city centre viewed from Ushers Quay (the traffic plan itself played down the visual impacts). The plan was based on similar thinking to what had been done in Birmingham and Liverpool to facilitate fast car access into and through the heart of the city. 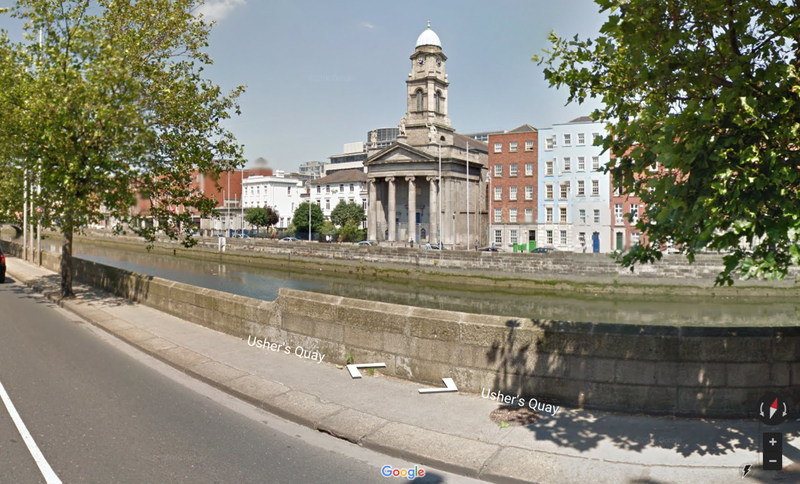 The grade-separated Liffey crossing proposed a high-level bridge for through traffic raised some 8m above the quay level with two-lane slip roads joined by quay-level bridges. The map above right illustrates the route of the road in relation to (A) The Four Courts (B) St. Patrick’s Cathedral and C) St. Paul’s Cathedral (illustrated in photo). Although the re-instatement of the sections of the quays in modern years has been of varying quality the current condition of the city is vastly preferable.